U.S. Chess Championship in Vancouver, WA. The 2015 US Open was held in Phoenix AZ August 1-9. Roland Feng’s score pushed his rating up 23 to 2403 making him a Senior Master. Roland’s 7-2 score won him $922.20 1st-4th Master (tie). He placed 4th in the BLIZ tournament. Grandmaster Alexander Shabalov won the event with 8.5-.5. 8 wins and a last round fighting draw. 491 players took part. There were a number of players from WA/OR/ID. William Schill 6-3, Viktors Pupols 6-3, Dakota Dixon 6-3, at 5.5-3.5: Brendan Zhang, Michael Hosford, Fred Kleist, at 5-4: Joshua Sinanan, Patrick Van Dyke, Alan Tan, at 4.5-4.5: Oscar Petrov, Robin Li-Yang Tu, Charles Whitmer, Shidhar Seshudri at 4-5: Morgan Larkin, Audrey Whitmer 3.5-5.5, Alan Bishop 2.5-6.5. Carl Haessler 6.5-2.5, Yogi Saputra 5.5-3.5, Gavin Zhang 5-4, Zake Winkler 4-5, Russell Crenshaw 4-5. Carmen Pensler 4-5, Charles Hughes 3.5-5.5, Adam and Dylan Porth both 2.5-6.5. 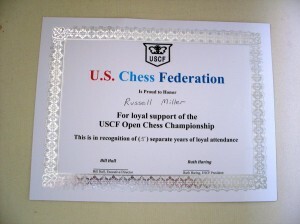 CLICK HERE for the full USCF crosstables. US Open in Madison WI had 519 players. There were a number from WA/OR/ID. Below are the scores of 4.5 or better from the 9 round event. Ratings listed are the one used for pairing the event. There were others who scored less points. Expect there will be a report in the September NORTHWEST CHESS as Murlin Varner was there once again and he usually does a report. The below was posted on the USCF issues forum by one of organizers. Let me know if anyone has any questions about the 2013 US Open. The playing site is the Madison Marriott West in Middleton, WI. The Marriott has a carpeted convention center that we’ll be playing in. There is also a large carpeted ballroom where the meetings and Denker/Barber/NGIT Opening Ceremony will be held. All of these are on the first floor of the garden style hotel. Wisconsin is proud to host the event. The last time it was held in Wisconsin was 1953! I’ve heard reports that the room block has filled up. If anyone has an issue with getting a reservation at the hotel, please contact Pat Smith at the USCF office and she will arrange to have the room block made larger. She has already done this a couple of times. Once the hotel is full, we have a spillover hotel if necessary that is right across the street. On the event’s information page there is a link to a PDF that I created with information on the area of the hotel. Note especially the restaurants within a ten minute walk of the hotel. Be sure to check flight schedules often. We’ve seen prices rise and fall overnight. I use http://www.itasoftware.com to find the cheapest flights then go to the airline’s sites to book. If you’re still worried that a flight to Madison is too expensive, consider flying into Milwaukee (MKE) or Chicago O’Hare (ORD) and taking a bus to Madison. Either http://www.badgerbus.com (Milwaukee) or http://www.vangalderbus.com (O’Hare) will drop you off at Dutch Mill Park and Ride. It’ll still be a $20-$25 cab ride (estimate) to get to the west side hotel. If you’re driving, find US-12 which we call the Beltline Highway in Madison. The Marriott is right at exit 252. Looking forward to a great event and save some room in your suitcase for a large block of cheddar! One my 96 Photos from 113th US Open. 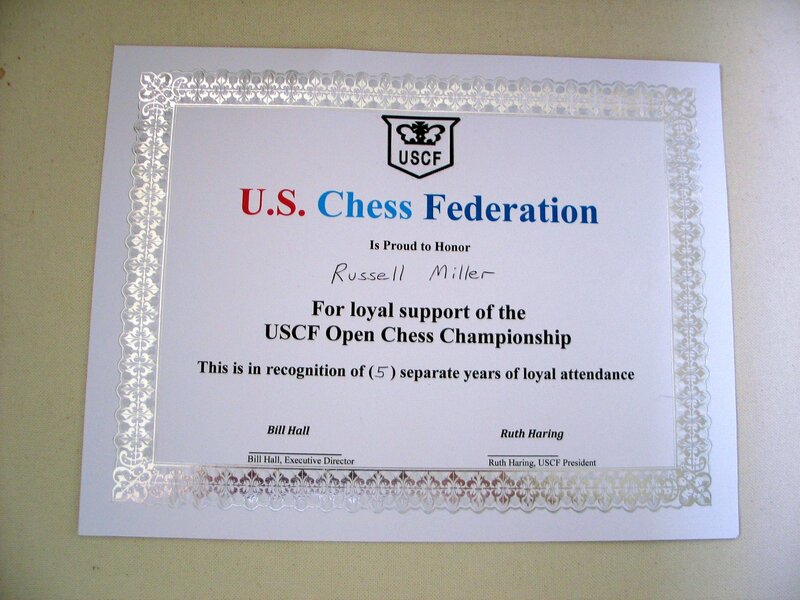 Posted on August 16, 2012 August 20, 2012 Author Russell (Rusty) MillerCategories U.S. OpenTags "113th US Open Chess Tournament"
Al Lawrence’s final report for Chess Life Online gives mention of NWC ‘stalwarts’ and has another shot of the Pupols-Seirarwan photo. The piece is positive towards the Vancouver venue and it also gives some acknowledgement to the Webster University team sweep of the G/15, blitz and open events. 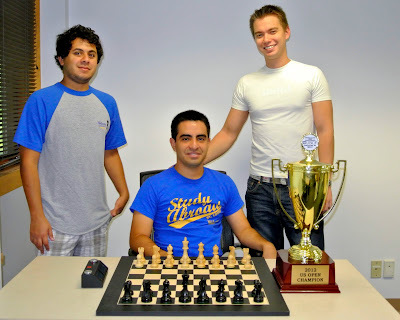 Webster University team members Andre Diamant, Manuel Leon Hoyos (seated) and Vitaly Niemer completed an unprecedented sweep of the Blitz, Open and G/15 events at the 2012 US Open in Vancouver, WA. 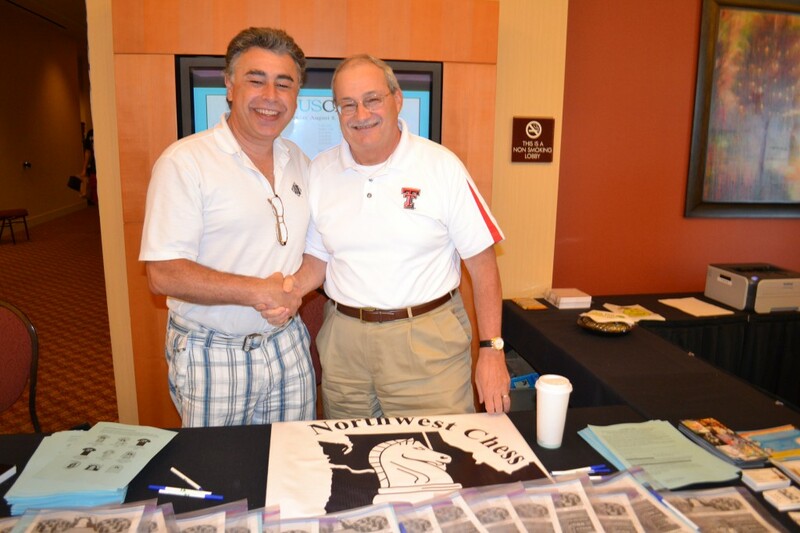 Photo credit: Susan Polgar Chess Daily News and Information. 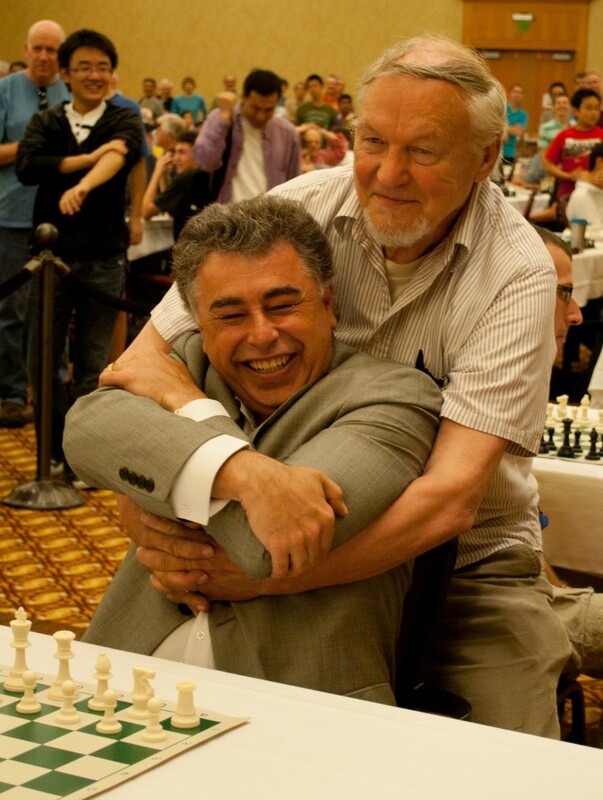 Viktors Pupols and Yasser Seirawan, reenacting a photo shot nearly 40 years earlier. 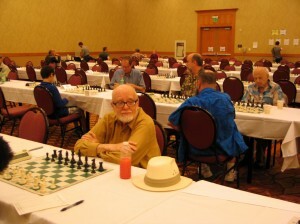 This will likely be the cover photo for the September 2012 Northwest Chess magazine. Photo credit: Jeffrey Roland. GM Manuel Leon Hoyos won an Armageddon playoff with the white pieces to earn the title of 2012 United States Open Chess Champion. Hoyos finished with an 8-1 record, the same as GM Dmitry Gurevich and FM John Bryant of California. The top two players on tiebreak (Hoyos and Bryant) were seeded into the playoff for an extra $200 in prize money and the championship trophy. An Armageddon style playoff is a one game blitz match of 5 minutes vs. 3 minutes (in this case with 5 second delay), black having draw odds. Hoyos is the reigning Mexican Champion currently attending Webster University in St. Louis. Bryant, as the first American finisher on tiebreaks, will be seeded into the next U.S. Closed Championship, assuming that the current qualifying rules remain unchanged for 2013. The final crosstable is located here. 517 players total with 19 from Clark County. Three players tied for 1st place with 8 points out of 9: Grandmaster Manuel Hoyes of Mexico, Grandmaster Dmitry Gurevich of Illinois and FIDE Master John Bryant of California. The United States Chess Federation hopes to return to the Pacific Northwest in the next 6-10 years. The 114th US Open will be in Madison WI. and 115th in St. Louis MO. The event is held once a year and moves around the country. It was last held in this area in Portland Oregon in 1987 with 532 players and 1966 in Seattle Washington with 201 players. 8 players who played in Seattle also played in Vancouver. Andy May played in the one day Blitz tournament and tied for 7th to 14th place. 129 players took part. Sarah May placed 2nd in the 2012 US Women’s Open. Historic photo reenacted (Pupols & Seirawan) click here. 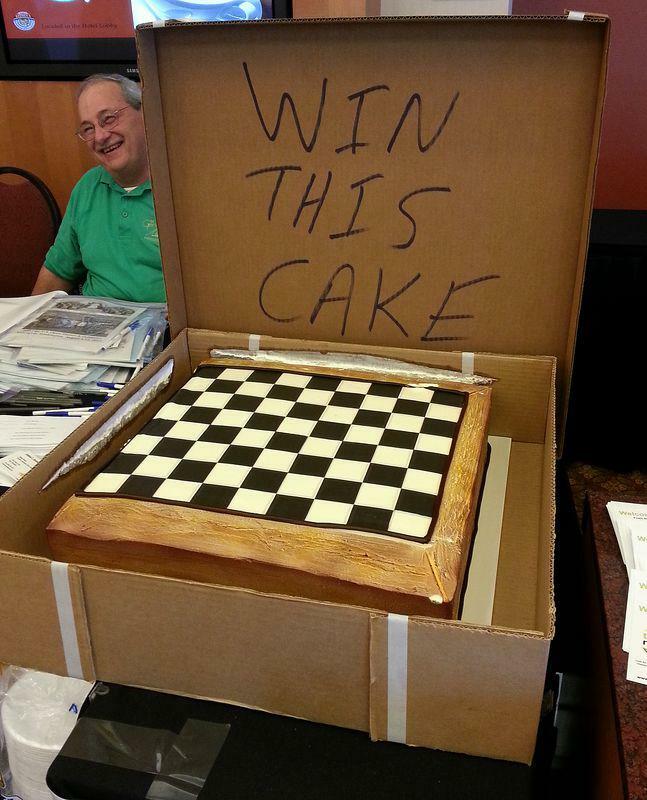 From the Idaho Chess Association web site. Webster University makes a clean sweep. 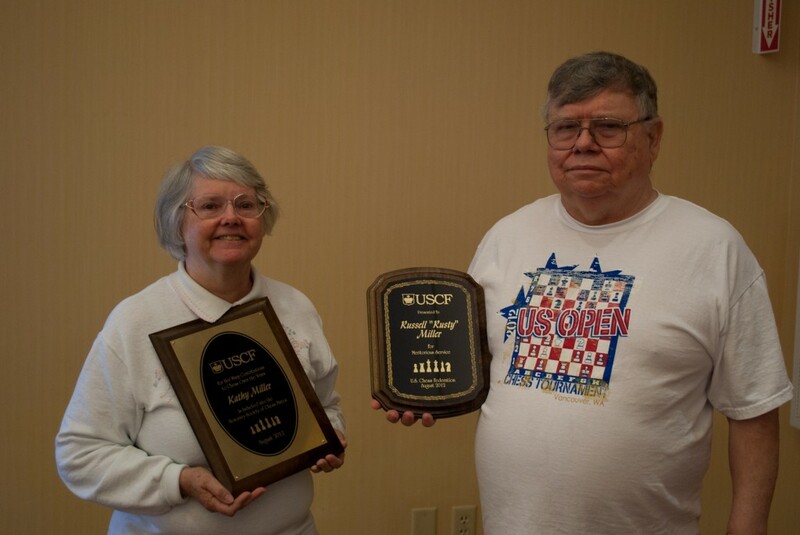 For USCF online coverage by Al Lawrence, click here. There were only 6 players taking part in this event. Saletan from WA 1.0 $225.00. Unr. 1st John Dimick from WA. 5.0 $700.00, 2nd Eric Pacini 4.5 $400.00 3rd Corey Tache from OR, 4.0 $200.00. Welcome to the Northwest Chess blog! Beginning with the U.S. Open in Vancouver, WA, NWC officers and editors will be able to use this blog to communicate directly with our web audience. Comments are welcome and may be sent to the author of the article or to info@nwchess.com. – Eric Holcomb, NWC Business Manager and Webmaster. All blog entries will appear on the main blog (home) page. To view only blog entries in a particular category, click on that category in the sidebar. You can also view archived blog entries by month. Additional links are available on many of the NWC webpages. Kathy & Rusty Miller were among those honored at the 2012 US Open Awards luncheon on Saturday, August 11. Photo credit: Jeffrey Roland. Quad #4 Sanford Long from WA, Nicholas Wong from HI 2.5 $25.00 each. There were 129 players participating in this event. The winners were: 1st Andre Diamant from Brazil 12.0 $490.00, 2nd Anatoly Bykhovsky from Israel 11.5 $245.00, 3rd tie U2400 Shetty Atulya from MI, Steve Breckenridge from OR & Nick Raptis from OR 11.0 $184.00 each, 1st U2200 Bryce Tiglon from WA 11.0 $245.00, 2nd U2200 Tanraj Sohal from BC, Michael Wang from WA, Andy May from WA, Li Zhaozh from IL 10.0 $30.00 each. 1st U2000/1800 Yifei Han from BC & Takum Duncan from OR 9.0, $233.00 each, 2nd U2000/U1800 Charles Unruh from OK, Tony Kukavica from CA. Josiah Stearman from CA. & Ethan Neff from WA. 8.5 $58.00 each, 1st U1600 Jack Gabriel from OR 8.0 $170.00, 2nd U1600 Diallo Wilson from WA 7.0 $85.00, 1st-2nd U1400 Marc Huang from WA. & Nathan Jewell from OR. 7.0 $90.00 each, 1st U1200 Brian Chen From WA $$85.00, 2nd U1200 Nicholas Wong from HI & Ethan Wu from OR 5.0 $$23.00 each, 1st-2nd UNR. David Jensen from WA, Stephen Vance from WA & Ian Vaughn from WA 5.0 $33.00 each. There were 15 states represented in this tournament. Blitz report on Susan Polgar Daily News and Information. 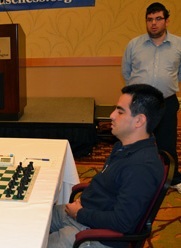 Pictured above: Manuel Leon Hoyos, current champion of Mexico and member of the Webster University (St. Louis) chess team is the top rated player in the event and owns the only perfect score through 7 rounds. Yaacov Norowitz studies the game in the background. Photo credit: Al Lawrence (courtesy of USCF). 517 players are now clashing in one section. I have the good fortune to be sharing a room with former U.S.C.F. Executive Director Al Lawrence, who is covering the event for Chess Life and USCF Online. Click here for this morning’s report form Al, including some of the top games. The annual awards luncheon is today. We have no Internet access at the playing site so our coverage has been necessarily spotty. Link to the complete standings is here. Click here to view photos of the 2012 US Open by Rusty Miller. Carl Haessler brought a 9-square by 8-square chessboard cake from Beaverton Bakery for a raffle to attract people to the Northwest Chess table at the 2012 US Open in Vancouver, WA. 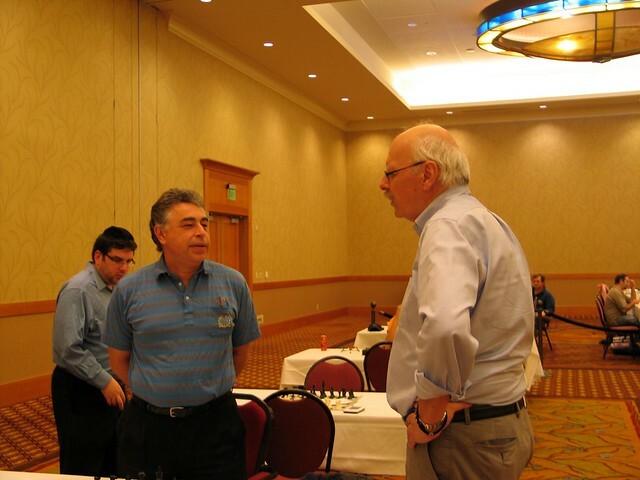 GM Yasser Seirawan and Yaacov Norowitz, the top two seeds in the group of 200+ players in the traditional 9-day schedule, drew their game last night allowing IM Salvijus Bercys and reigning Oregon champions Steven Breckenridge to climb into a four way tie for first place. GM Dmitry Gurevich heads a seven-player pack lurking a half point behind with three rounds to go in the 2012 U.S. Open Chess Championship. The 113th annual event is currently underway at the Hilton Hotel in downtown Vancouver, Washington. Denker High School Champion Atulya Shetty of Michigan is leading the six-day schedule after five rounds with a perfect score, a half point ahead of GMs Alejandro Ramirez and Alexander Shabalov, Andrew Ng and local favorite Igor Ummel of Washington. Link to the USCF cross tables. Quad # 5 Jon Eikenberry from Or. 3.0 $50.00. It out for the prize money. 1st-2nd Andre Diamant from Brazil/MO Vitaly Neimer from Israel/MO. OR. & Jeremy Harlin from Wa. 2.0 $41.00 each. From Hi. 1.0 $38.00 each. 15 players participated in two 4 player Quads & a Mini Swiss. From HI. 2.0 $8.33 each.